You have seen them on Facebook – it’s the back to school pictures with the kids carrying their backpacks, leaving their house or walking to the bus. We are blessed that we get to stay at home for our school days! I don’t have to pack up, load up, and pick up every. single. day. But I still want those cute pictures! 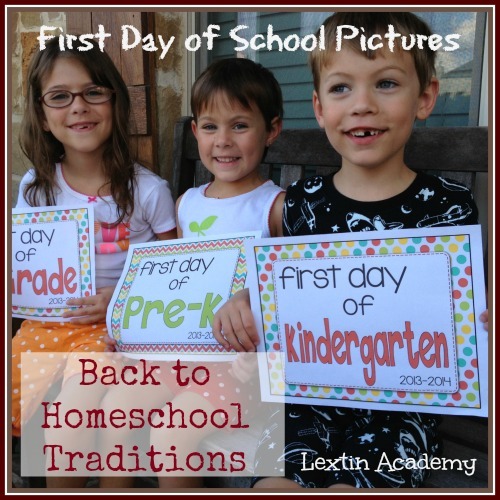 So, every year we print out some cute little signs and we take a million pictures to document our new school year. But the key to cute pictures is to take them the night before. I bathe the kids, dress them in their adorable (matching and clean) new pj’s, and we head outside to take lots of pictures! This ensures that I have Daddy to help me and I don’t feel rushed trying to get them back inside to start our day. The kids love holding up their signs and showing the world what grade they are beginning – and it has also helped them remember what grade they are in when all the nosy people ask them that very question. I love seeing how they’ve grown and changed over the years! Love the idea of doing it the night before. Thanks for sharing.